Sudbury native Alex Trebek, 76, with Sudbury Jeopardy contestant Reem Fattouh. Alex Trebek celebrated his 76th birthday July 22. Longtime Jeopardy! host Alex Trebek was born in Sudbury on July 22, 1940 to George Edward Trebek and Lucille Lagacé. Before he became the host of Jeopardy! in 1984, Trebek earned a philosophy degree from the university of Ottawa in 1961, and went on to work for the CBC as a newscaster and sportscaster. In 1973, he moved to the United States and hosted a game show on NBC called the Wizard of Odds. He went on to host a number of different game shows in the US before landing a job as the host of the revived Jeopardy! in the mid-1980s. 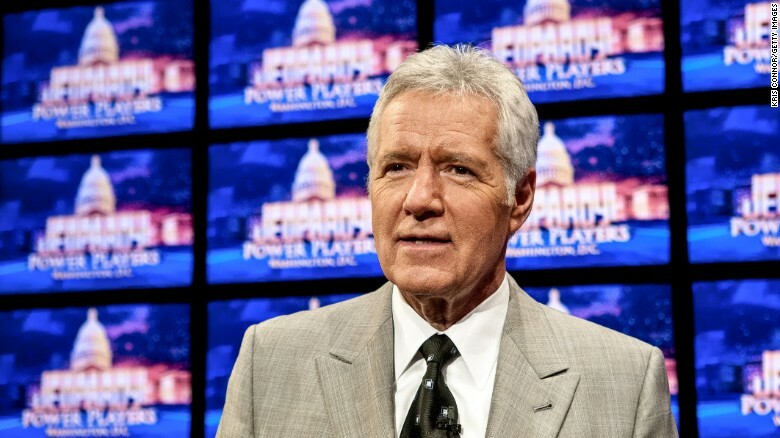 While Trebek became a naturalized citizen of the United States in 1998, he has maintained his Canadian roots and paid a visit to his hometown last summer for a special guest appearance in the Amazing Race Canada. He also used his Sudbury visit to attend a family reunion. Alex Trebek is the No. 1 host on the No. 1 quiz show in the world. The popular Emmy Award-winning host of the game show Jeopardy!, George Alexander ”Alex” Trebeck, graduated from the University of Ottawa with a degree in philosophy. His broadcast career began with the CBC as a newscaster and a sportscaster. He also did a wide range of specials for the CBC’s radio and television divisions. In 1964 he began hosting the high school quiz show Reach for the Top, followed in 1970 by the TV show Jackpot. He moved to the United States in 1973 to NBC as host of a new game show, The Wizard of Odds. He was offered Jeopardy! in September 1984. He has been its host ever since. In 1991, he became the only host in United States television history to emcee three daily national game shows simultaneously: Jeopardy!, Classic Concentration, and To Tell the Truth. Trebeck has been married to his second wife, Jean Currivan-Trebeck, since 1990 and the couple has two children, Matthew and Emily. His interests include racing, training and breeding thorough-bred horses at his ranch near Paso Robles, California. Trebeck has received numerous awards and honours: four Outstanding Game Show Host Emmy Awards as well as a star on Hollywood’s Walk of Fame in Toronto. His dedicated work with several educational and charitable organizations, as well as his extensive efforts on behalf of World Vision, are admirable. In his free time he travels to Third World countries with World Vision projects taping reports on the group’s efforts on behalf of children throughout the world. Trebeck became a naturalized American citizen in 1998 and now lives with his family in Studio City, California. He frequently mentions his Canadian birth and heritage on Jeopardy! He is bilingual, thanks to his mother, Lucille Lagace. Has won five Daytime Emmy Awards and received 29 nominations. He has also received onePeabody Award. While reciting clues from musical categories such as “It’s a Rap,” Trebek has been known to spit rap lyrics. Has toured with the USO 13 times. He says his spirit animal is the musk ox. 1961 – Joins Canadian Broadcasting Company as a newscaster. 1973 – Becomes host of “The Wizard of Odds” on NBC, produced by Alan Thicke. 1989-2013 – Hosts the National Geographic Bee. 1998 – Becomes a naturalized U.S. citizen. 2000 – Receives a star on the Hollywood Walk of Fame. 2001 – Trebek suddenly shaves off his signature mustache. December 2007 – Is hospitalized after having a mild heart attack. 2011 – Trebek receives the Lifetime Achievement Award from the National Academy of Television Arts & Sciences. July 27, 2011 – Tears his Achilles tendon chasing after a burglar who had broken into in his hotel room in San Francisco. June 23, 2012 – He is admitted to Cedars-Sinai following a mild heart attack. 2013 – Trebek is inducted into the Broadcasting and Cable Hall of Fame. June 13, 2014 – With his 6,829th appearance as “Jeopardy!”‘s host, Trebek breaks the Guinness World Record for hosting a game show.